If it is a soft and assertive fragrance you're looking for, the GOSH DNA 4 is exactly what you need. It is part of the DNA collection which consists of four fragrances for men and four for women. 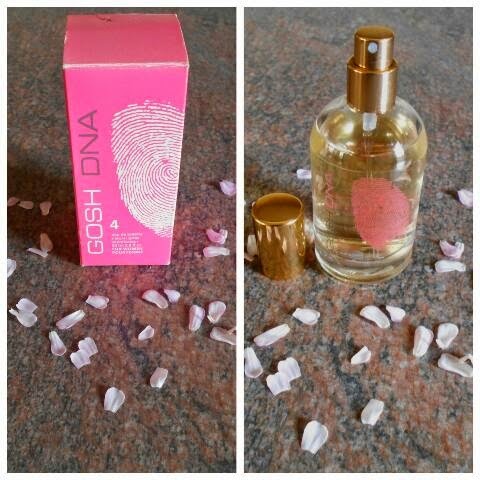 GOSH DNA 4 is packaged in a pink box with an image of a finger print. Inside the box is the simple bottle with a golden lid, again there's an image of a finger print. The scent however, screams anything but simple. It is feminine, fruity and sweet smelling and overall intoxicating. A combination suitable for a Disney Princess. The shape and size of the bottle make it great to keep in your handbag. The fragrance is longlasting, take a whiff about 5 hours later and you can still catch the fruitiness. Luckily for me, the perfume was on sale when I bought it but it is fairly inexpensive. Longlasting fragrance, a beautiful design and an affordable price. GOSH DNA 4 definitely gets an A from me.